I'm going to begin this by saying that I really think it's time to find another solution for journaling. I have no idea how many more versions we'll see before Microsoft rips Journal's heart out. It's time to move on to something that is going to be around longer. On the other hand, it's possible that Microsoft has removed all they can without breaking backwards compatibility, in which case, the Journal module might be mostly left alone for another 10 years. I don't have a crystal ball and Microsoft isn't saying anything more than the "journal is deprecated" and deprecated features have a way of hanging on, thanks to their need to provide backwards compatibility. OneNote is one possible option as a replacement for the journal. I have a VBA sample to Copy Outlook Journal Entries to OneNote. For those users who aren't ready to move on.... I'll share some facts about the state of the Journal in Outlook 2013 and workarounds to make it more useful and less broken. The Journal button was removed from the Navigation pane / Peeks row. The keyboard shortcut of Ctrl+8 works or you can select the Journal from the Folder list. Currently, a Journal button can be added to the ribbon or QAT. Open the Options dialog to Customize Ribbon or Customize Quick Access Toolbar. Add a New Group then Add journal to the group. If the Journal command is missing in your version of Outlook, you can use VBA to switch to the Journal and assign it to a QAT or ribbon button. The New Journal button was removed from the New Items command and the shortcut to create a new journal item from any folder (Ctrl+Shift+J) was removed. You can either browse the New Item button and open the More Forms command and select Journal, switch to the Journal folder first, or use VBA to open a new journal item and assign it to a QAT or ribbon button. If you have Outlook 2013 v.15.4535, New Journal Entry is listed in ribbon customization. Use the steps above to custom the ribbon or QAT. Look for New Journal Entry under All Commands. If you have an earlier version of Outlook, you need to install updates. This code sample creates a new journal entry for the selected contact. To work with open or selected contacts, get the GetCrurrentItem function from Work with open item or selected item and use Set oContact = GetCurrentItem() instead of Set oContact = ActiveExplorer.Selection.Item(1). MsgBox "Sorry, you need to select a contact"
This variation of the macro creates a new journal entry for the selected email message. As with contacts, you can use it with open or selected items if you use the GetCurrentItem function and change the Set oMail line. 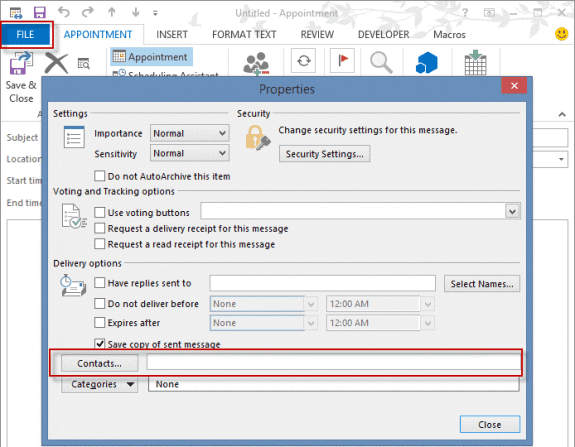 MsgBox "Sorry, you need to select a message"
Journal options were removed from Outlook 2013's File, Options dialog, meaning that there is no UI around to edit the settings. This included the dialog where you could choose to journal email from specific contacts, and automatically create journal entries for Office documents. In applications that support VBA, you can create journal entries automatically using VBA. See Create a journal entry for Word documents in Outlook 2013 for a sample that creates a journal entry when you open a Word document. Contact activities were broken in Outlook 2010 and completely gone from Outlook 2013. You'll need to use Instant Search or custom views to find journaled items. You can use VBA to create an Instant search in the journal folder. Use the VBA code samples at Use Instant search to find messages from a contact, then select a contact and run the macro. With the journal tweaks, the macro will open the journal folder and search for the contact's name in the Contacts field. There is easier way to add "Journal" to the Navigation Pane at the bottom, next to Calendar, People, Tasks etc. That 1 at position 8 is the one that enables "Journal". Thanks - not as slick as dialing fromt he contact record and having the Journal record open - but still makes journal usable. I use the journal in order to be able to keep track of documents I worked on for timekeeping purposes without having to physically write down all the time entries and then type them into a timekeeping program. I just go to my journal to see what I have saved or where I have been. I love the journal! You can use any view on the calendar - timeline, list, calendar format. You can either use the Date stamp feature or a custom form with code behind to insert a date stamp - or use a macro to create the entry and add a date stamp ( .Body = Date + Time) A macro could handle timer features, although it might not be a convenient as the journal's built in timer. The journal folder is going to be around for awhile yet - while I'm discouraging people from using it, those who want to use it can. if you need the timer and other journal specific features, use it. The only thing that is broken is the Activities and autojournaling features. phone would be .BusinessTelephoneNumber - to see all of the phone fields, open the object browser (F2 or View menu) then select Outlook from the libraries list and type phone in the search field. First of all: Many thaks for your superb site. So much help here! I tried to get your "new journal entry for selected contact" work in Outlook 2016. A journal entry is created. But unfortunately only the "company" field of the selected contact is transferred not the name (more precisely: the "linked contacts" entry which I reactivated via registry entry "ShowContactFieldObsolete") . How can I fix that? In addition using Set oContact = GetCurrentItem() to create journal enry from open contact gives me a failure "sub or function not defined" with the first line of the code highlighted in yellow. What did I do wrong? did you get the GetCurrentItem function from https://www.slipstick.com/developer/outlook-vba-work-with-open-item-or-select-item/ ? On the contact field entry, that field uses the 'subject' field of the contact, which I'm guessing is set to company name (which is surprising - it's usually either full name or "full name - company") To verify, use a list view on the contact folder and customize the view by adding the subject field to the view. Journal can record files from Excel, Power Point, Word, and Access, Is there a method to add OneNote to the record file menu? I'm using Outlook 2010. No, and with the journal being deprecated, it's not something they are going to add. (They removed the office document tracking in Office 2013). Has ANYONE actually found a viable alternative for the Journal in being able to take notes or call logs and have them linked/attached to contact profiles? Either as an Addon for Newer Outlook versions or completely replacing Outlook? There seems to be nothing out there except maybe the extremely expensive CRMs (and those cannot import from journal either). How do other people handle taking daily call notes and linking them to a contact file? I cannot believe I am the only one stuck here unable to move from Outlook 2010. You can still use journal and you can link contacts to the journal entry. What you can't do is use activities to find them or automatically journal incoming email or other office documents.